Periodontal diseases are major causes of tooth loss and contribute to significant morbidity and healthcare costs. Therefore, identifying areas that deliver substantial returns with community-based preventive programs are a dire necessity. Planning and implementing preventive measures in periodontal oral care require identification of not only a population with current disease burden, but also of future susceptibility to disease. All major periodontal indices that have been used in community periodontal surveys are designed to identify either severity, prevalence, or treatment needs of periodontal diseases. No known index exists based on scientifically proven risk factors of periodontal disease to identify population susceptible to the disease, and to determine the need for preventive planning and interventions. 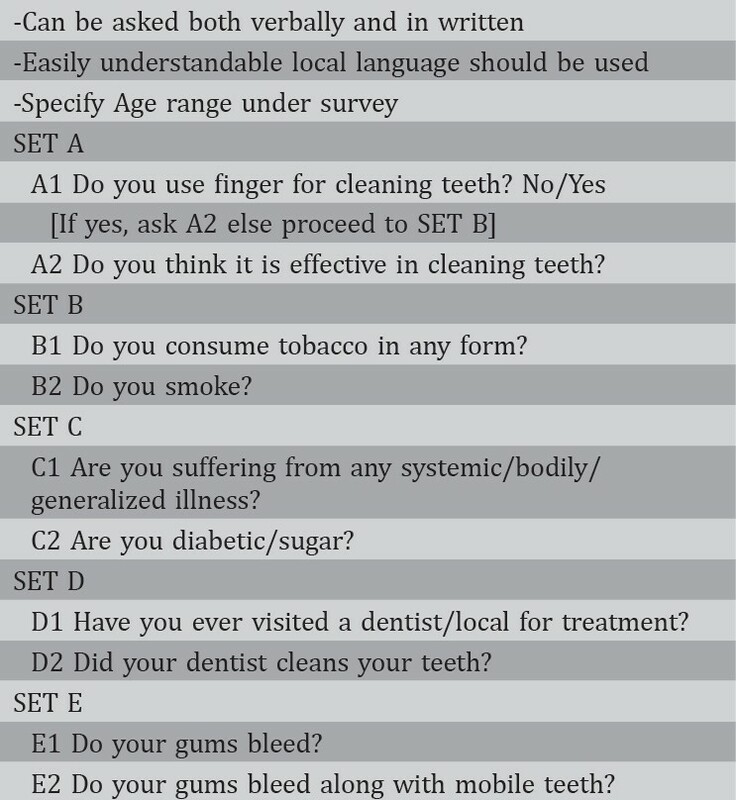 In this article, a simple questionnaire-based index has been proposed to identify both individual and community susceptibility to periodontal disease. Periodontal diseases are highly prevalent all over the world. In India, a high prevalence of periodontal disease has been reported in earlier studies , . Such high prevalence means increased treatment-needs and susceptibility of the population to periodontal disease. Since periodontal diseases are a major cause of tooth loss resulting in high treatment/replacement cost in the majority of the population, it is important to identify areas that are cost-benefit and cost-effective; a need for community-based preventive program. Planning and implementing preventive approaches in periodontal oral care require identification of not only population with current disease burden, but also those that are susceptible to the disease. All major periodontal indices that have been used in community periodontal surveys are based on identification of the severity, prevalence, and treatment needs. There is no known index based on scientifically proven risk factors of periodontal disease to determine disease susceptibility and to identify the need for preventive planning and interventions. 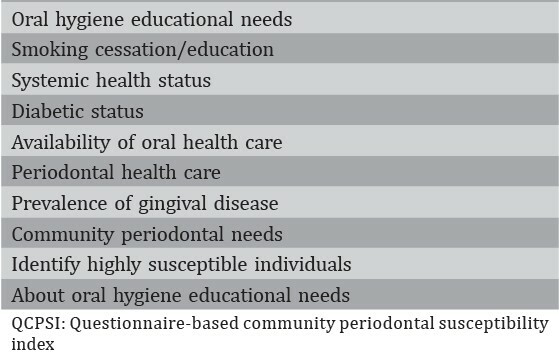 In this article, a simple questionnaire-based index has been proposed to identify both individual and community susceptibility to periodontal disease. Indices based on determining periodontal treatment needs for periodontal diseases are both time consuming and show inter-examiner differences  . In addition, they measure the past disease morbidity, present oral hygiene conditions, and treatment needs. None of them provides information about the susceptibility to further loss and social risk factors, which are more relevant to preventive dentist or oral health care programmer. In addition, apart from genetic susceptibility, all major risk factors for periodontal disease are based on social determinants of health. Risk factor control and elimination are the primary objective in both the periodontal prevention and treatment to maintain a stable and healthy periodontium. Questionnaire-based community periodontal susceptibility index (QCPSI) is easy, simple, quick, noninvasive and does not require any special training to administer. Moreover, it yields a lot of periodontally and socially relevant health care information and identifies areas for periodontal preventive health care. Furthermore, it calculates individual susceptibility along with community susceptibility to segregate individuals at high risk for further evaluation. [Figure 1] presents details about the QCPSI, and the chart and scoring are illustrated in [Table 1]. Both QCPSI chart and index have been designed to obtain substantial information on periodontal diseases, and are useful in ascertaining socio-demographic and lifestyle characteristics that contribute to the etiopathogenesis [Table 2]. In addition, the index helps in determining individual and community periodontal disease susceptibility. Only known index that determines periodontal susceptibility based on social factors. Does not include all the risk factors and inappropriate weight to certain factors. Periodontal diseases are highly prevalent disease affecting a large majority of the population. Effective prevention in periodontal diseases can control both disease morbidity and treatment costs. Needs assessment of individual and community susceptible to periodontal diseases is of utmost importance to combat the diseases at an earlier stage. Until date, no known periodontal index has predicted community susceptibility to periodontal disease. QCPSI is simple, quick, non-invasive index that can yield a lot of useful information to target periodontal diseases in the population. To what extent it is able to deliver its intended purpose, however, can only be judged by controlled comparison with other established indices in actual field surveys, and future studies should be warranted in this direction. All authors contributed equally to the study and confirm that they have read and approved the final version of the manuscript. Shah N, Pandey RM, Duggal R, Mathur VP, Rajan K. Oral Health in India: a Report of the Multi Centric Study, Directorate General of Health Services, Ministry of Health and Family Welfare, Government of India and World Health Organisation Collaborative Program; 2007. Mathur B, Talwar C. National Oral Health Survey and Flouride Mapping 2002-2003. New Delhi, India: dental Council of India; 2004. Holmgren CJ. CPITN - interpretations and limitations. Int Dent J 1994;44:5 Suppl 1:533-46.